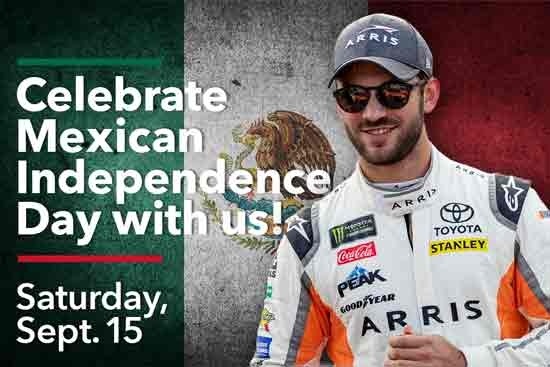 LAS VEGAS Las Vegas Motor Speedway is planning a number of special events to help celebrate Mexican Independence Day during the DC Solar 300 NASCAR Xfinity Series race on Saturday, Sept. 15. From social media activations, special appearances, mariachi band performances and live event coverage from Hispanic media outlets, DC Solar 300 race day will feature a number of Hispanic-themed events throughout the property to help celebrate Mexican Independence Day, which kicks off Hispanic Heritage Month across the country. Monterrey, Mexico, native Daniel Suarez driver of the No. 19 Toyota for Joe Gibbs Racing Monster Energy NASCAR Cup Series car will be the featured guest on the Neon Garage stage in the LVMS infield at 11:45 a.m. Pacific Time on Saturday. After a Q&A with fans, Suarez will present a Hispanic Heritage Award to a deserving member of the Las Vegas community. LVMS will welcome internationally renowned singer and songwriter Victoria La Mala to sing the national anthem before the DC Solar 300. The Mexico City, Mexico, native is a rising star who has been named one of 5 Mexican Millennials You Need to Hear by Billboard magazine and who was nominated for a Premios JuventudÂ’s Producers Choice Award in 2016. La MalaÂ’s single Si Va A Doler Que held down the No. 1 position on the charts in El Salvador, cracked BillboardÂ’s Top 40 in the United States and also hit the top spot in six different charts in Guatemala last year. She also was a celebrity participant on UnivisionÂ’s popular dancing competition Mira Quien Baila and has been confirmed to open up for Romeo SantosÂ’ Golden tour. IÂ’m super excited to perform the National Anthem for the DC Solar 300 race at Las Vegas Motor Speedway, itÂ’s a dream come true. La Mala said. This will be my first NASCAR race, and I canÂ’t wait to be a part of it. I will be wishing all the drivers luck as they compete for the championship, and itÂ’s going to be a fun day! La Mala, who was included in BillboardÂ’s Latin Artists to Watch article in 2015, is very active on social media. She has a presence on Twitter (@VictoriaLaMala), Instagram (www.Instagram.com/victorialamala) and Facebook (www.Facebook.com/VictoriaLaMala). The Canyon Springs High School Mariachi Band will perform in the Turn 4 Turn Up gathering spot on the concourse behind Turn 4 at 11 a.m. Entravision will provide live remotes from LVMS throughout the day, and the Mundo Hispanico news media outlet also will be on-site providing coverage from the dayÂ’s activities. In addition, a number of Hispanic social media influencers will attend the races and share their experiences on their social media channels throughout the South Point 400 weekend.